Businesses should always look for new ways to implement technology. If you don’t keep up with the new things coming out, you risk falling behind and becoming obsolete. So what can you do to ensure this doesn’t happen? Look into remote support software. This lets you easily help your customers whenever they need tech support. 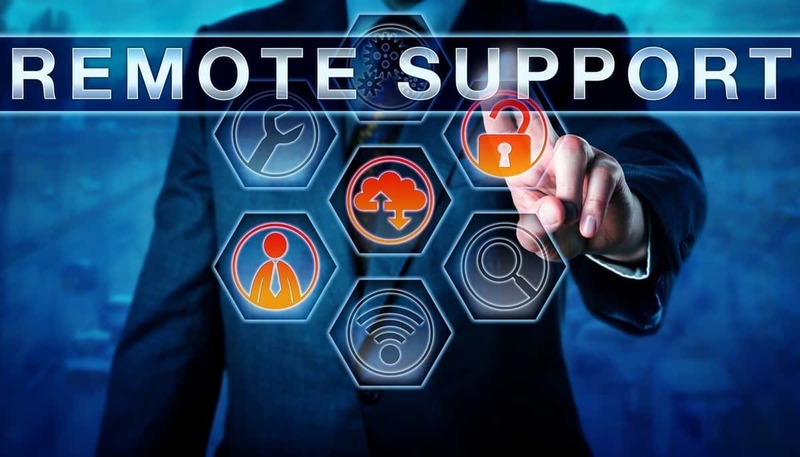 In this article, we’ll tell you what the options for remote support software are. Remote support software is used to access another computer or device across the internet, or across a LAN. When this software was introduced, it revolutionized the IT support industry. While it may not sound so exciting, this kind of software’s been responsible for increasing customer satisfaction, increased turnaround time on tech support jobs, and reduced costs for IT services. By using remote access software, an IT crew can access any computer linked up to the network. This means a single IT tech can work on multiple jobs at once. In the past, it would’ve been necessary for them to physically access the computer. In some cases, that computer might be so far away that the tech would need to drive to the work site. With remote access software, the likelihood of needing to do this is significantly reduced. This can save a lot of time and money. This kind of software is not just useful in the professional world. Do you have friends or family members who always want you to fix their computers? By using remote support software, you can access their computer from the comfort of your own home. You’ll see a representation of their computer screen and you can control it as if it were your own computer. A lot of the software has additional features such as voice chat or video chat, so you can explain what you’re doing as you go. There are two different types of remote access software. Attended, or on-demand remote access software is for when someone needs immediate assistance with an IT issue. Using on-demand remote support, you connect to the client’s PC as and when they request you to do so. There’s also unattended remote support software. With this kind of software, the administrator can connect to a client’s computer even when they aren’t there. There are many reasons why this might be desirable. For example, if you utilize managed IT support services, the IT staff might want to run security patches on clients’ computers. If you needed to coordinate this and have every single user present at their PC while the updates ran, it could take a very long time. If you’re in the market for a remote access solution, you need to establish which kind of software you want. Both kinds can cut costs and increase efficiency, as they reduce the need for technicians to travel to clients’ computers. Every company has different IT needs. If you’re planning on purchasing a remote support software license, you should coordinate with your IT team. They’ll likely have a strong opinion on what kind of software you should use. Here are some of the most popular remote assistance programs available today. This is one of the more popular pieces of remote PC access software. If you want to use this software on a personal basis, it’s completely free to download and operate. This is some great software to use if you want to help friends or family members with computer issues. TeamViewer is also great software for more commercial applications. It has all of the features you could want in remote support software. For instance, it has a whiteboard tool as well as a voice over IP feature. This is software designed specifically with giving remote support to your customers in mind. It can be integrated quite easily into your company’s chat system so you can offer seamless support to users who are having issues. This is a great tool to consider if you’re looking for something exclusively to help your customers. Their support is very professional and well trained. If you have any issues with the software, you’ll find you’re in good hands. Mikogo is an exceptional piece of support software as it’s completely browser-based. There’s no need to download or install any software. It works on multiple platforms and is packed with great features. If you’re looking for remote support software at a cheap price, this is one to consider. If you just want to use this software on your local network, it’s free to use. If you want to use it across the internet, you can obtain a license fairly cheaply. Netop remote control is reasonably priced remote support software. It has quality end-to-end encryption so you can rest assured that any activity on the program will be properly secured. The developers of this software have gone through great lengths to enable you to customize the software to suit you and your business’s needs. Netop is an incredibly popular remote control software among businesses, with over half of the Fortune 100 companies owning a license. SolarWinds is remote software built for speed. The software provides fast, easy connections with your clients and has some deep diagnostic tools available. The software also has support for high-resolution monitors so you can see everything in great detail. SolarWinds Take Control also features some great customization options. You can really use this software to reinforce your brand identity. If your business isn’t making use of remote support software, you’re really missing out. The software can totally revolutionize your workplace and save you time, money, and effort. If you’re interested in integrating this kind of software into your business, talk with whoever is responsible for managing your workplace computer network. Looking for more on technology? Then read our post about high-speed satellite internet.